To celebrate Star Wars Day, I want to talk about the central information security failure that drives Episode IV: the theft of the plans. First, we’re talking about really persistent threats. Not like this persistence, but the “many Bothans died to bring us this information” sort of persistence. Until members of Comment Crew are going missing, we need a term more like ‘pesky’ to help us keep perspective. Kellman Meghu has pointed out that once the breach was detected, the Empire got off to a good start on responding to it. They were discussing risk before they descend into bickering over ancient religions. Can we have a red team analyze the plans for problems? This would be easy to do with a small group. Should we re-analyze our threat model for this Death Star? 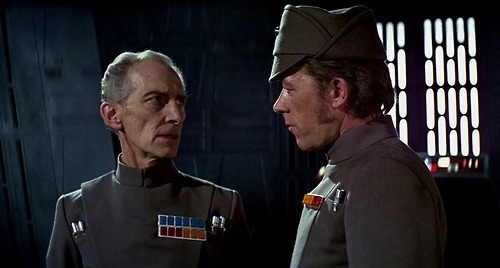 General Bast: We’ve analyzed their attack, sir, and there is a danger. Should I have your ship standing by? There are a number of things that might have been done had the Empire known about the weakly shielded exhaust port. For example, they might have welded some steel beams across that trench. They might put some steel plating up near the exhaust port. They might land a Tie Fighter in the trench. The could deploy some storm troopers with those tripod mounted guns that never quite seem to hit the Millenium Falcon. Maybe it’s easier in a trench. I’m not sure. What I am sure of is there’s all sorts of responses, and all of them depend on information leaving the hands of those six busy executives. The information being held too closely magnified the effect of those Bothan spies. So this May the Fourth, ask yourself: is there information that you could share more widely to help defend your empire? More generally, the Empire has the Strangelove fallacy: What is the point of building a doomsday device if you don’t tell anyone that you have it? The Death Star has a garrison of thousands at the very least. The size suggests that there is a garrison of at least a million. Even assuming that much of the construction was done by robots, the flows of raw material must have been noticeable. Security through obscurity is not a good strategy when you are trying to hide something the size of pluto. Awesome analogy. Effective and entertaining way to relate security to, er, real life. Thank you!